"Heart health and protein in a bowl! This recipe is an unexpected kick of flavor with egg, red quinoa, avocado, and feta cheese! Very easy to make and a delicious start to the day." Stir water and quinoa together in a rice cooker; cook until quinoa is tender, about 15 minutes. Heat olive oil in a skillet over medium heat and cook eggs to desired doneness; season with seasoned salt and pepper. 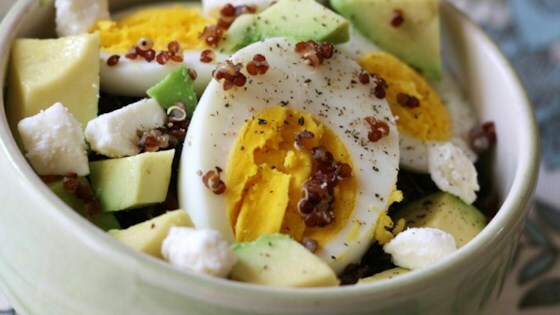 Combine quinoa and eggs in a bowl; top with avocado and feta cheese.